It’s also incredibly easy to build a V6 from an existing V8. Jaguar, for example, doesn’t even bother changing the outside dimensions of its block. 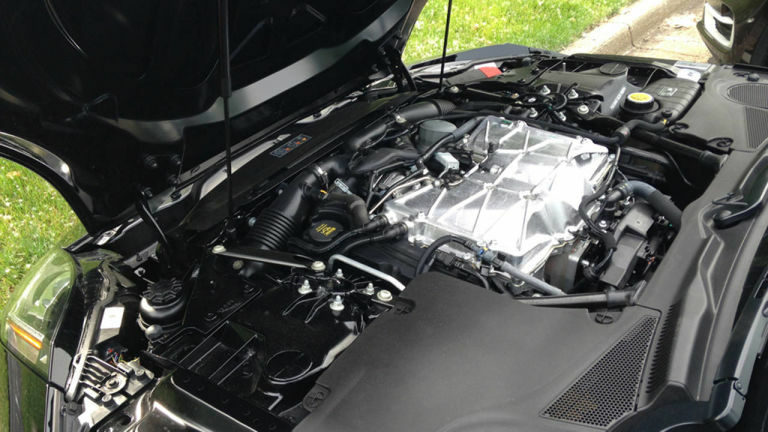 The company’s V6, available in every new Jag sold in the U.S., is simply its V8 with shorter cylinder heads and balancing weights on the crankshaft where the last two piston throws should be. It works, but not without compromises. Like all V8-derived V6s, Jaguar’s has a 90-degree angle between its cylinder banks. That works well for a V8, but it’s the wrong angle for a six, because it means the engine will fire at uneven intervals, and odd-fire engines run rough and make terrible noises. A V6 will fire at perfectly spaced intervals (read: smoothly) with its banks splayed to 120 degrees, but that’s too wide to fit in most cars. Halving that angle keeps the even firing order and, with a couple of crank counterweights, it allows for smooth running. Toyota’s ubiquitous 3.5-liter V-6 is a 60, and it’s as creamy as they come. But a 60-degree six negates the economic advantage of basing the engine off an existing V8. So luxury brands tend to stick with the 90-degree architecture and apply various tricks to make it work for a V6. The big one is using split, offset crankpins. These are impossible to fully understand without a physics degree and a stiff drink, but in essence, they slightly offset opposing pistons, forcing them to move in such a way that the engine fires evenly. But these are difficult to engineer and expensive to manufacture. Plus, the 90-degree V6 usually has an engine-driven balance shaft to prevent the whole complicated mess from vibrating itself apart. All of this adds expense, hurts efficiency, and requires royalty payments to Rube Goldberg. THAT LACK OF INTERNAL DISSONANCE GIVES THE SAME PERFECT BALANCE AS A V12. That complexity, however, masks the problem instead of solving it. The mass of the pistons moving up and down in an internal combustion engine creates enormous forces, which cause the engine to vibrate. The most effective way to reduce that vibration is to use the force of one piston to cancel out the force of another; in other words, as piston A moves in one direction (up), piston B moves in the exact opposite direction (down) at exactly the same time. 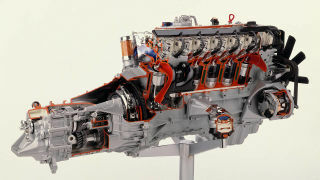 But that’s only possible for engines with an even number of pistons in a single plane, like an inline-four-cylinder. When you have an odd number of cylinders, as with an inline-three, the force moving in one direction (say, up) is almost always imbalanced compared with the force moving in the opposite direction (down). This makes the engine rock back and forth. Now think about a V6, which is essentially two three-cylinder engines joined at the crank—it’s like having a pair of amped-up pit bulls on a shared leash. And that typically means a whole lot of unpleasant mechanical noise, to boot. You can avoid the drama by arranging the pistons in one line. A straight-six doesn’t need split crankpins, balance shafts, or big counterweights, because each of its cylinders has a twin that’s doing the opposite thing, at the same time and in the same plane, canceling out the other’s forces. That lack of internal dissonance gives the same perfect balance as a V12. There’s a reason museum-piece marques like Rolls-Royce, Mercedes-Benz, Jaguar, Aston Martin, and Alfa Romeo earned their reputations with inline-sixes. At the moment, BMW remains the sole champion of the straight-six. Munich engineers admit that they regularly develop and test prototype V6s, per internal policy, but say the results don’t come close to meeting company noise and harshness standards. Mercedes-Benz must not have such stringent benchmarks. Once renowned for its silken inline-sixes, Stuttgart phased out those engines and began building V6s out of its V8s during the dark, cost-cutting days of the marque’s DaimlerChrysler ownership. As the sting of that failed merger continues to fade, so will the company’s coarse, complex, 90-degree V6, which is being retired in favor of a 60-degree unit. This stopgap engine, which fits into the vee-focused packaging of Mercedes’s current lineup, is noticeably smoother than the 90-degree unit, but its exhaust still sounds like Fran Drescher on Spanish fly—not the voice you want your luxury car to sing with. That’s likely one reason Mercedes is rumored to be developing a new family of inline-sixes. And because accountants, not engineers, usually run the show these days, you can be sure there’s an economic incentive as well. As tightening fuel-economy standards encourage four- and six-cylinder engines where sixes and eights once lived, an inline layout becomes the norm and it makes financial sense to develop a modular family of inline-threes, fours, and sixes. Add the straight-six’s other cost-savings (half as many cylinder heads, camshafts, and turbos), and suddenly, tougher emissions mandates have the unintended consequence of unifying the dreams of engineers and bean counters alike. It’s a dream aligned in one straight line.